I spent the last bank holiday weekend exploring a little bit of Canterbury; see what I got up to in the city in my recent video and if you're curious to know what I wore each day then you're at the right place! Funnily enough you can't see any of my outfits in my vlog haha, a bit of a fail! But most of these have been posted over on Instagram (so if you'd like to see what I wear every day then follow me there). Rather than tagging each item like I would usually do in my posts, I've added a little widget under what I wore where you can click on the item and it will take you straight to that piece on the relevant website, I hope it's helpful! Saturday was our busiest day; we spent the day exploring Canterbury so comfort was key. I wore a pair of Topshop joni jeans, which I'm actually not a huge fan of, the pair I have are on their way out so to speak - believe it or not, they were once jet black! I've been loving throwing on shirts, I think spring is the perfect time to wear shirts and this khaki one from Topshop is my favourite as it's quite oversized (I sized up) so I tied it at the waist for something a little different. I feel like it's acceptable because joni jeans are super high waisted. 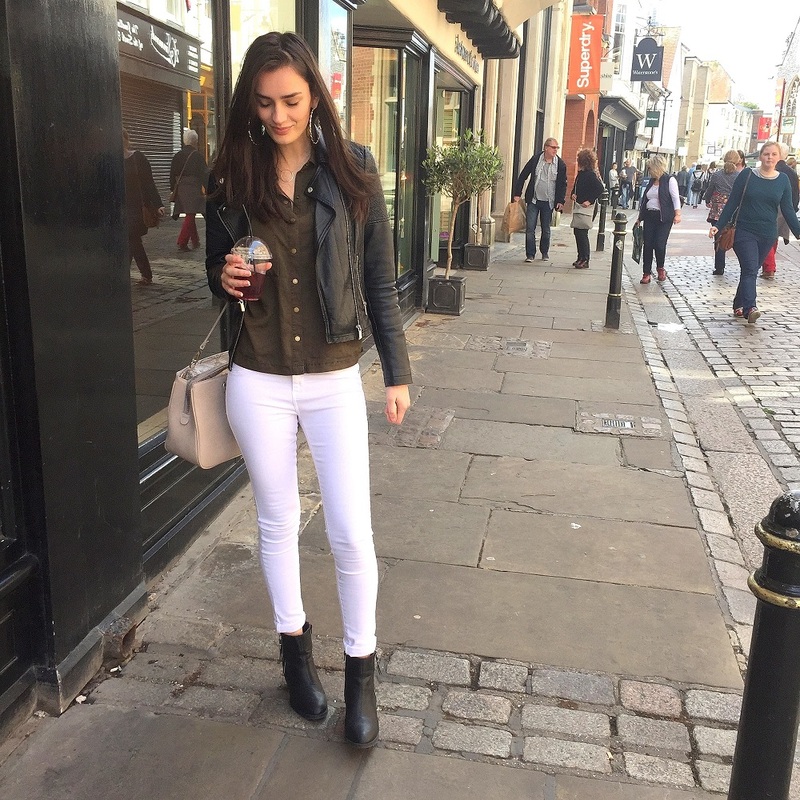 I wore a new pair of lace up flats from Primark #sorrynotsorry and my essential, a leather jacket of course, this one is from Miss Selfridge - one of my favourite places for buying leather jackets! - I finished it all off with a big bag from Marc b.
Sunday was definitely more of a relaxed day, that's what Sunday's are for after all, we had a pub lunch and did a bit of shopping. 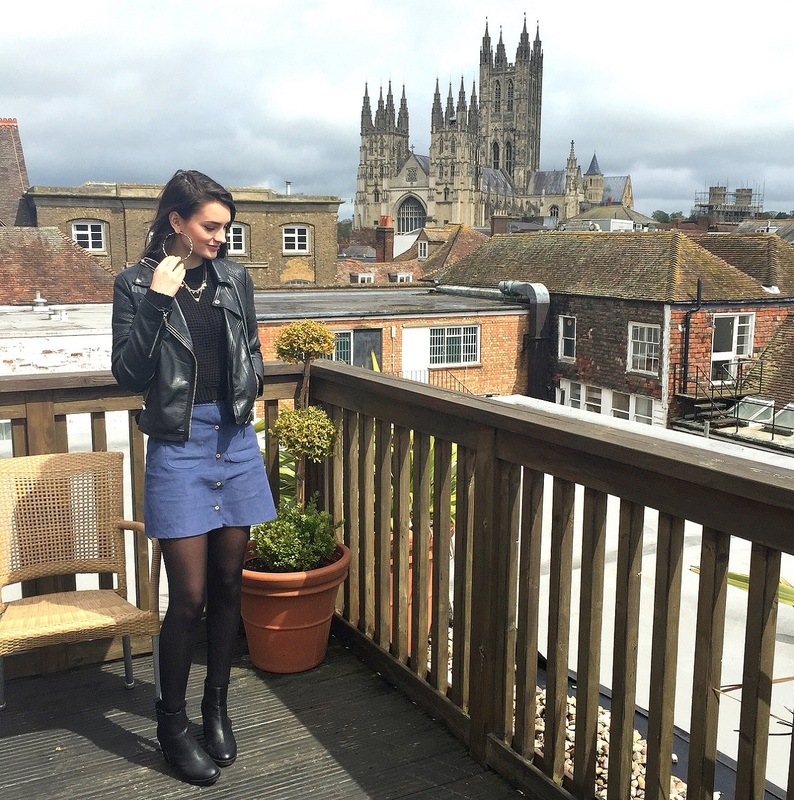 I feel Sunday is a nice day to put in a little more effort, I wore an a-line skirt from ASOS which is a slightly different take on the popular denim version and I find it's a little more flattering too. 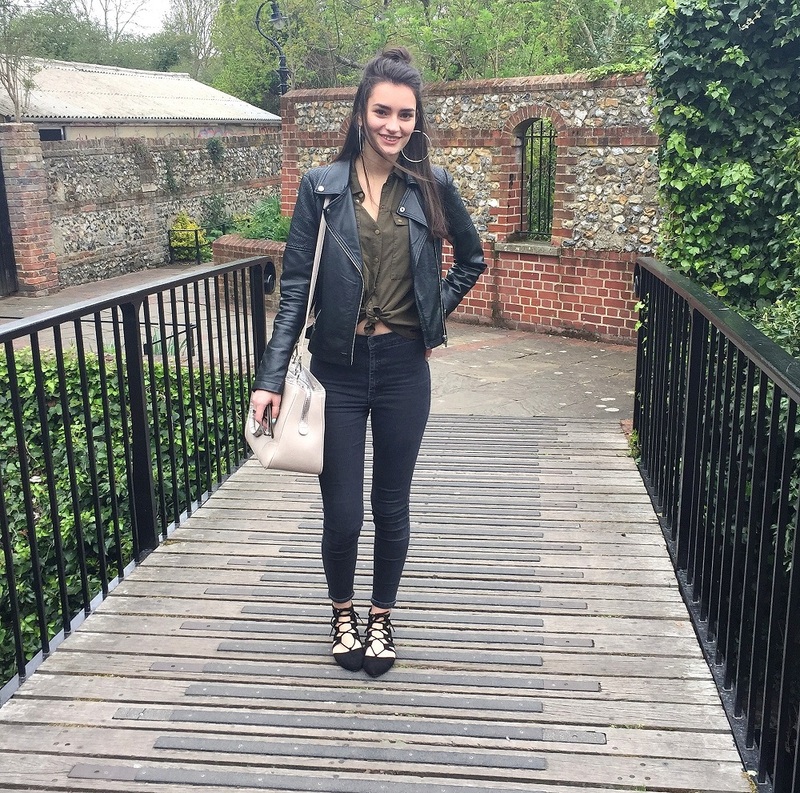 I kept the rest of my outfit really simple with a cable knit crop from Boohoo, again my Miss Selfridge leather jacket (I wore it everyday...) and a pair of black boots with gold detailing from Chockers Shoes. This is my favourite outfit of them all. I finally found a pair of white jeans that I absolutely love, these are River Island and they're amazing! Honestly, they're pure white and there's no opaqueness at all - hooray! I feel a bit naughty having worn the Topshop khaki shirt again.. but I'd say it looks different because this time it isn't tied at the waist... agreed? Agreed. Finished off with black boots from River Island and of course, Miss Selfridge leather jacket. Oh and my Marc b. bag! It's the perfect size to carry all the unnecessary things I tend to carry around with me on a daily basis haha, it's also in the sale now! Have you ever visited Canterbury? Where are the best places to visit in the UK? Love your Canterbury outfits, your style is great! 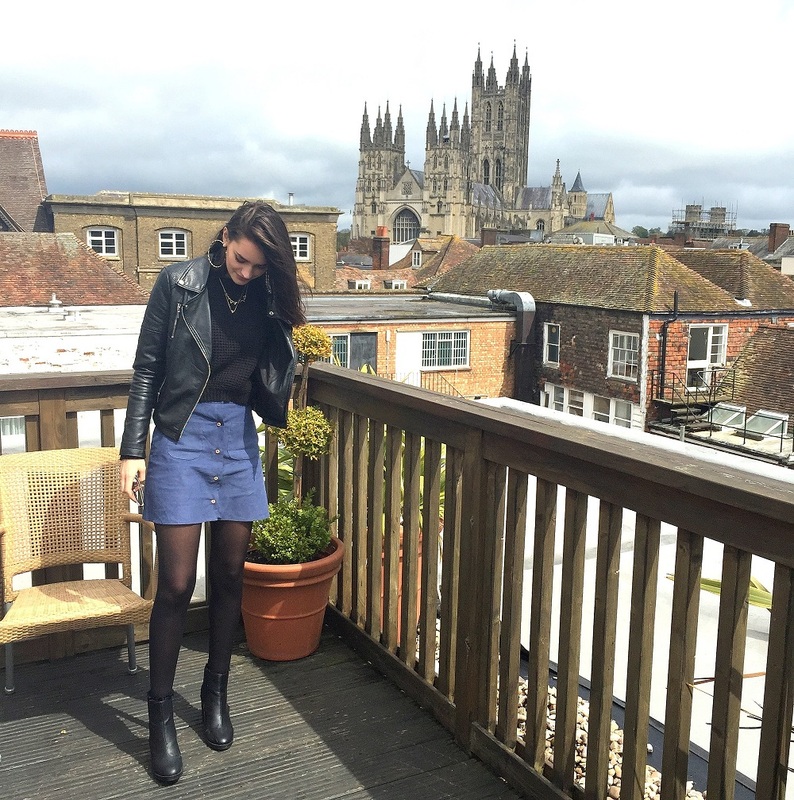 You look fabulous in that light blue button front Asos A-line skirt! You look great in the white River Island jeans too, and the khaki Topshop square bottom shirt looks nice styled with them. I love the YouTube video from your weekend in Canterbury! Your ride down the river was fascinating. I liked seeing the stone masonry. I went to uni in Canterbury - it's one of my favourite cities!!! !